Curiously, the stand-in for the digital fairy was a Bratz doll, painted green and with its hair cut off. 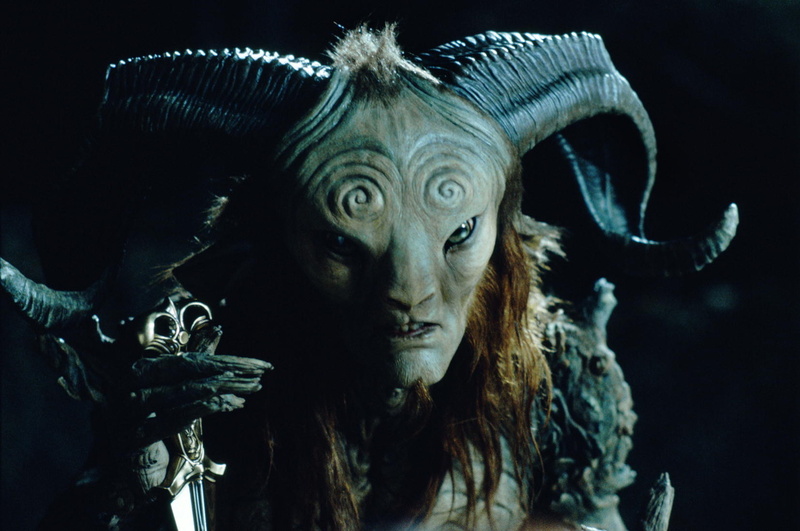 The actual fairy, designed by Sergio Sandoval, was initially conceived during the production of Hellboy (a prototype appears, unseen, inside Rasputin’s gauntlet). 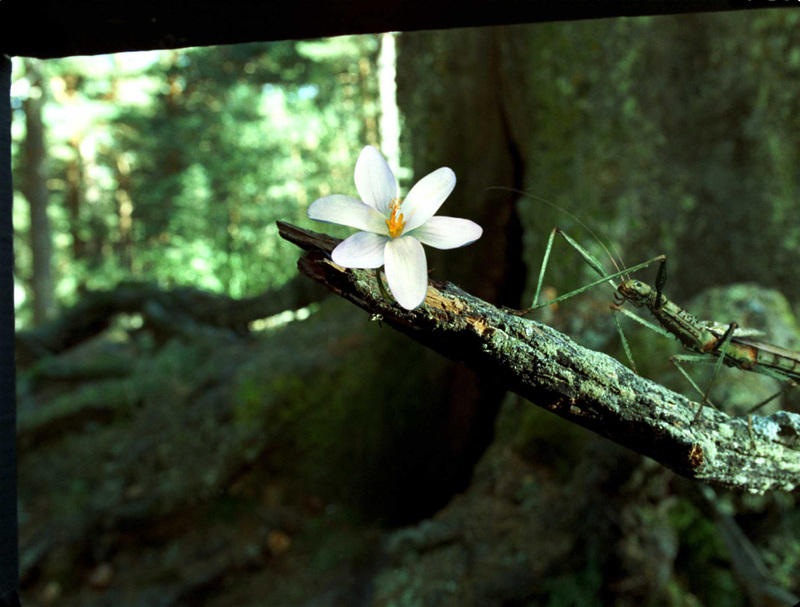 It presents a similar colour scheme to its stick bug form and a faintly translucent skin. Two other fairies are also seen, in blue and red variants. The design tried to stray from overtly traditional configurations. 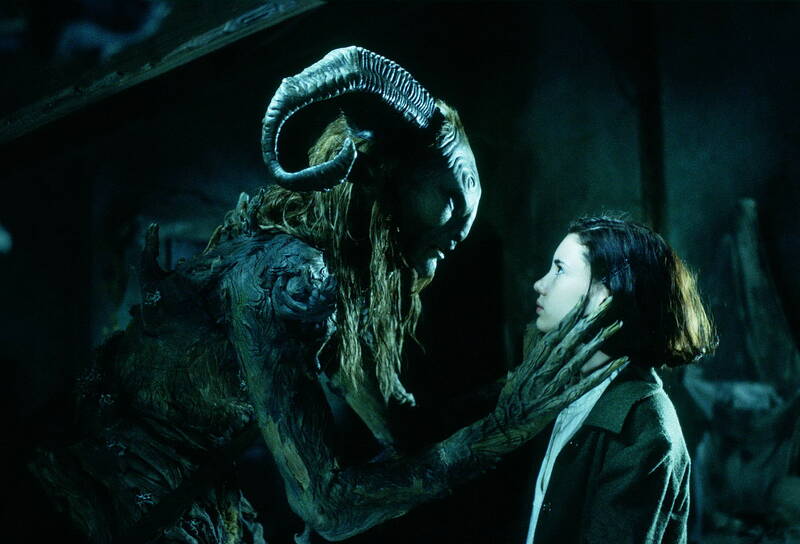 “I wanted them to look like little monkeys,” Del Toro said “like dirty fairies. They eat meat. They scratch all the time.” Artists at CafeFX suggested the concept of leaf-like wings, an idea Del Toro approved immediately. The aged Faun. 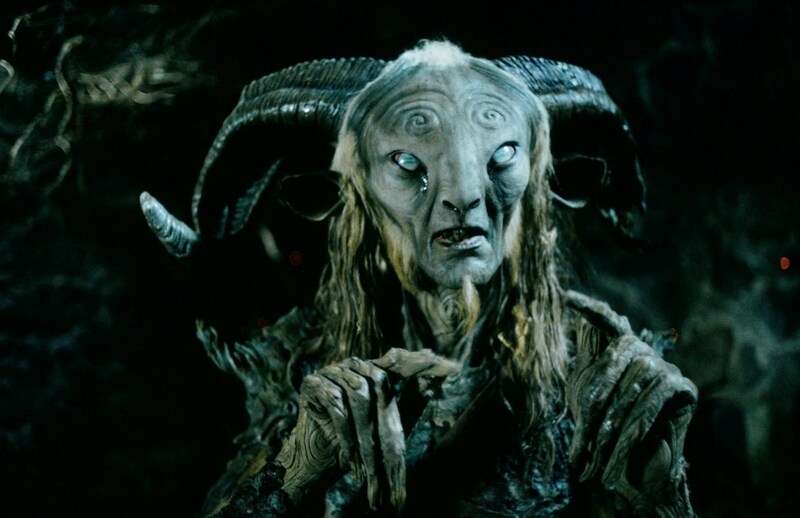 Notice the broken horn, pale golden hair, and eye cataracts — traits that rejuvenate as the film progresses. It’s you — it’s you! You’ve returned! On its hind quarters, in the shadows, is the twisted and sinister figure of a FAUN. He’s covered in roots and moss. 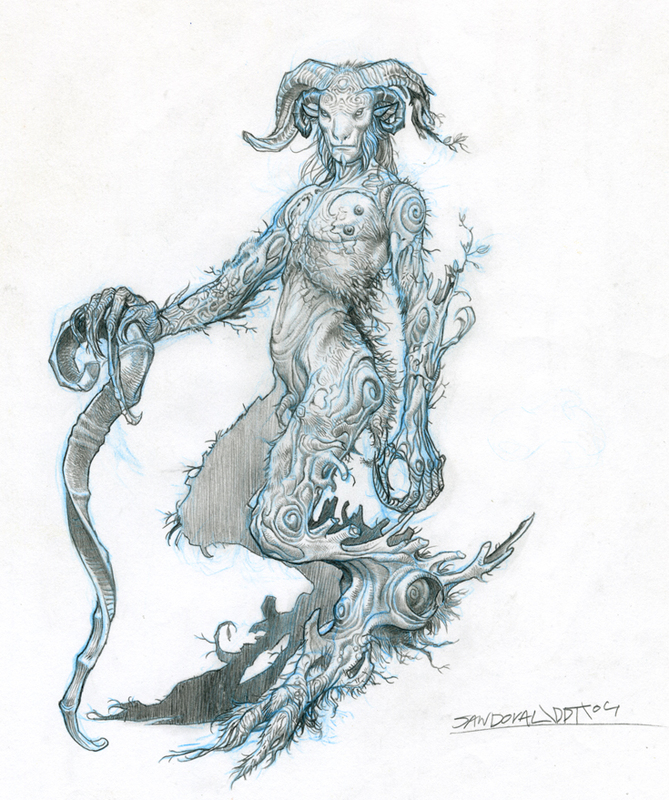 One of Sandoval’s Faun concepts. The Faun was sculpted by David Marti (for the head) and Pau Loewe, Arturo Balseiro, Jose Menenses and Nelly Guimaras (for the body). 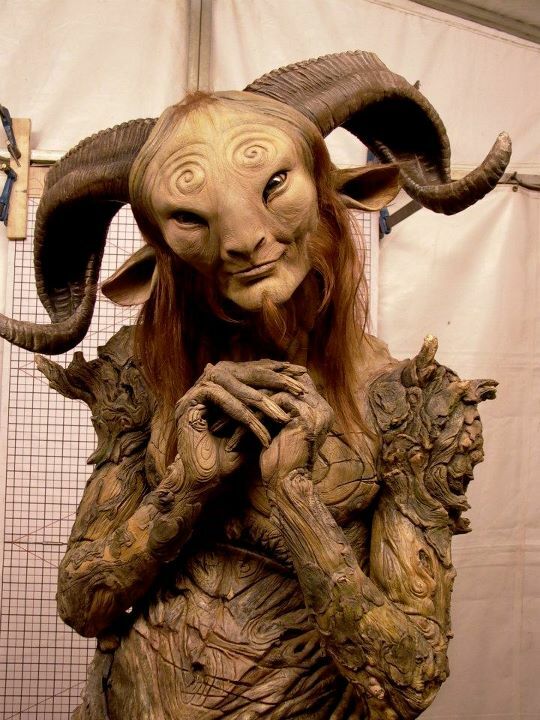 DDT built two suits and an animatronic head extension — an understructure containing the mechanisms animating the Faun’s face — which was then covered in foam latex skin. Only Jones’ lower head portion was directly seen in make-up. The actor also wore dental prosthetics. Marti recalled: “it took about two hours to put on the head, then two more hours to fit him in the suit. We added the horns last, on set, because it was difficult for Doug to fit through the door frames wearing those.” The motion of the creature’s eyes, nose and ears was controlled by servo motors (devised by mechanical designer Xavi Bastida) contained in the horns themselves. The position of the Faun’s eyes only allowed limited visibility through small openings in the creature’s tear ducts. A separate neck piece was applied at the collarbone and blended with the head make-up. 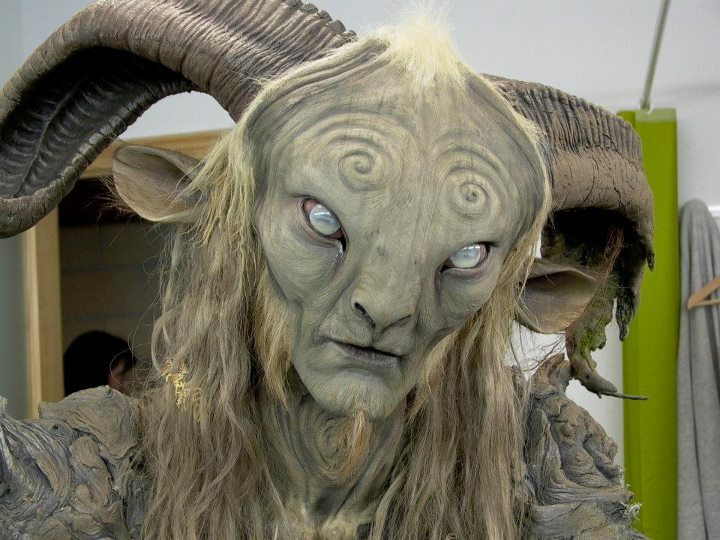 Jones as the Faun, filming one of the last sequences for the film. The Faun’s legs are digitigrade, with a rather extended metatarsal section. 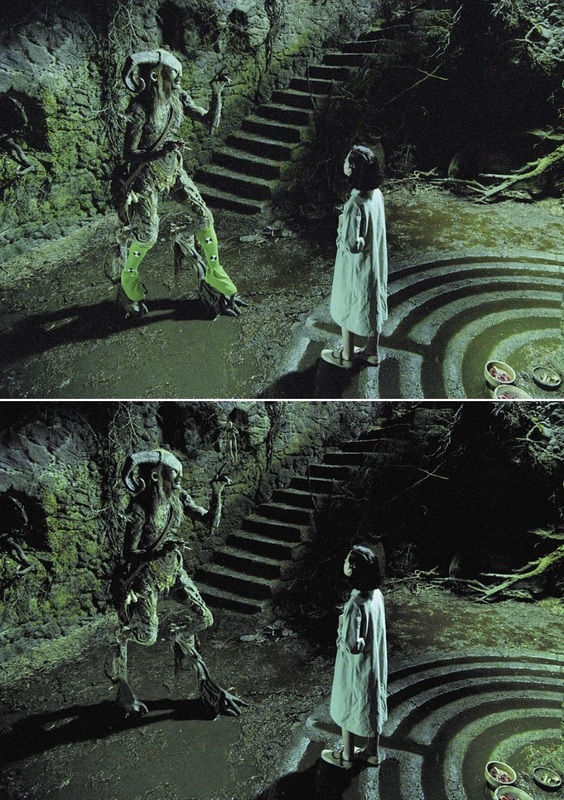 In order to properly portray them in the film, the special effects team combined practical and digital effects, with a system devised by the director himself: Jones wore leg extensions that covered his thighs and then protruded backwards, simulating the anatomy of the creature, only to reconnect at the feet. To puppeteer them, Jones simply had to move his legs in different manners, depending on the kind of motion a specific shot requested. 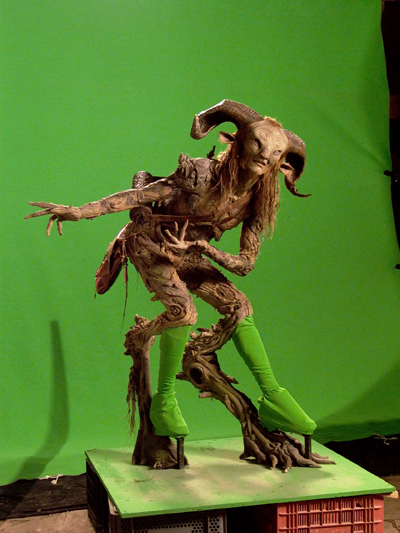 The unsuited portions of his legs, when seen in the shot, were covered with cloth of varying colours (depending on the shot), which enabled CafeFX to remove them and present the Faun’s legs as intended. Clean plates were used to recreate obscured portions of the background. When the Faun was seen from the front, however, almost complete digital legs were employed. Irastorza said: “on side shots it was fairly easy for us to clean up [the Faun]’s legs. The prosthetic legs were behind Doug’s stilts, and Doug’s shin area was covered in green, blue or black material, depending on where we were shooting. 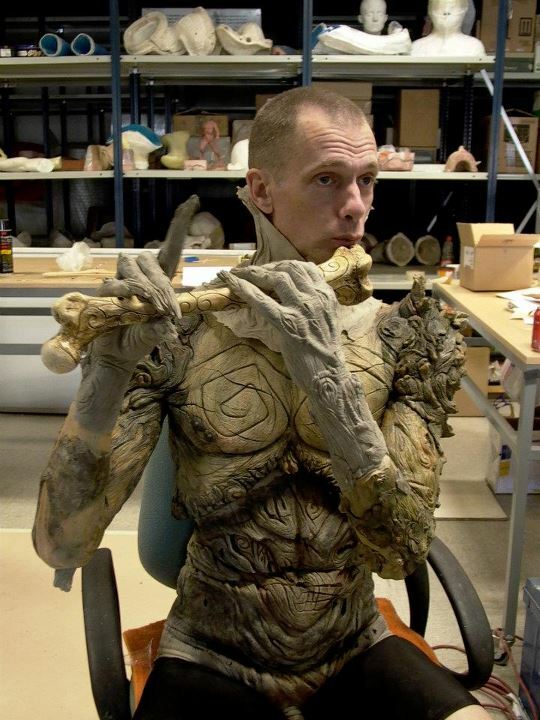 Wherever we had full frontal shots, though, we had to completely create digital legs because Doug’s legs obscured the prosthetic.” In the full suit, Jones as the Faun stood almost seven feet tall. The rejuvenated Faun, with lively goat eyes and brown hair. The creature was visually influenced by Francisco Goya’s painting Saturn Devouring His Son (1823) and, curiously enough, by an acquaintance of Del Toro and Irastorza. The latter commented: “the idea was for a man who had been very fat and lost a lot of weight quickly. This was based on a producer Guillermo and I had worked with, who was very old and had sagging, disgusting skin. This guy had been around for so long, we used to say he had been a production assistant on Battleship Potemkin — at least, that was the joke we made, lovingly.” Del Toro was also inspired by a quick loss of weight he had experienced. 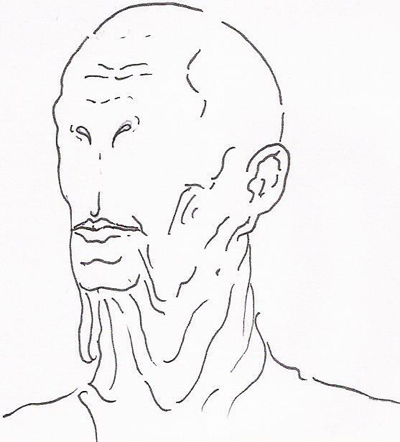 Sketch of the Pale Man’s head by Sergio Sandoval. 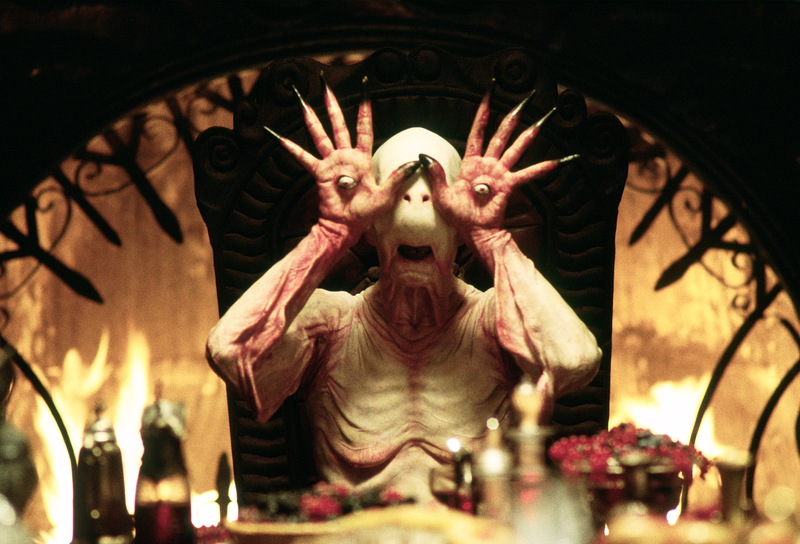 Originally, the Pale Man’s face was to resemble an old man’s — but Del Toro eventually discarded the idea, deeming it “trivial.” To emphasize the creature’s hunger, the director decided to render the face “blank” and eyeless. The concept of the creature’s eyes laid on a plate before him was influenced by a statue of St. Lucy Del Toro had seen in his childhood, whereas the eyes on the palms were inspired by a poster for the 1979 Italian horror film Phantasm (Fantasmi) — where the eyes of a screaming woman can be seen flashing through the hands covering her face. 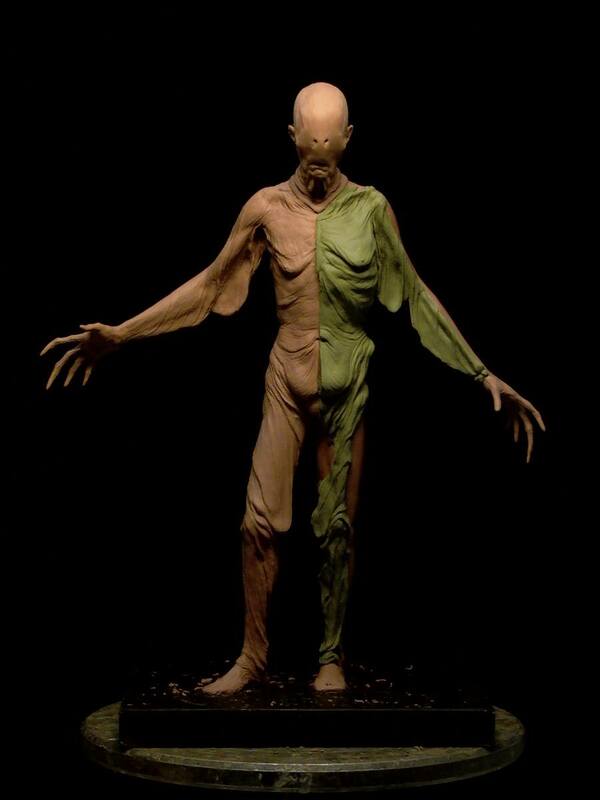 Tuiten’s Pale Man maquette, showing the suit-only option (left side) and ‘puppet’ option (right side). 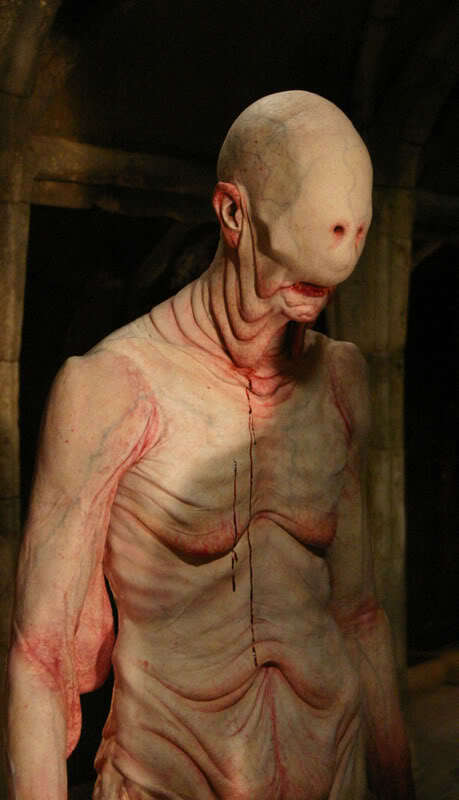 Jones as the Pale Man. The portions of his legs covered in greenscreen cloth were erased in post-production, with the missing background recreated through clean plates. 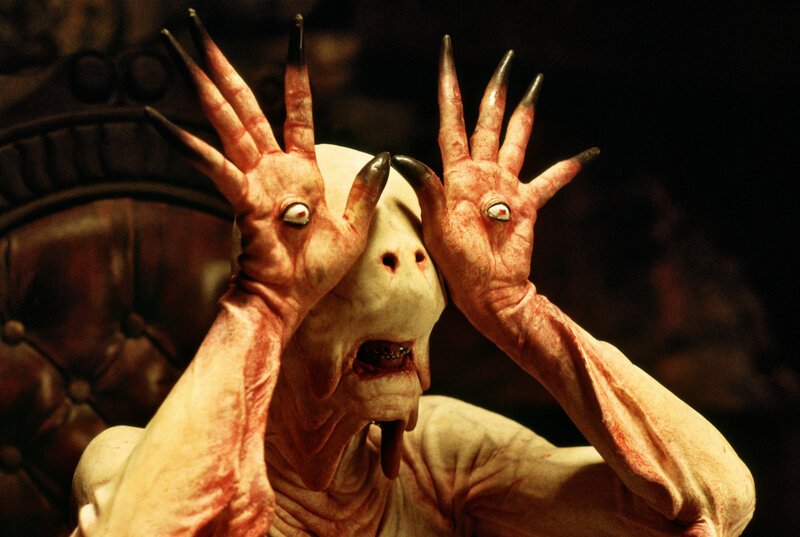 Jones could only see through the Pale Man’s nostrils while cross-eyed. “I had no eyes in my head,” Jones said, “since they were in my hands, but the nostrils were up kinda high and kinda big, and that’s what I looked out of. I could see out of the right nostril with my left eye and the left nostril with my right eye. So it was a disorienting cross-eyed thing going on.” To ease the performance and shooting schedule, the Pale Man was also built as a featureless dummy for the scenes where the creature sits still, slumbering, at its banquet. An insert animatronic arm was built to portray the creature inserting its eyeballs in its palms. In post-production, CafeFX also added a blinking animation; the eyes were digitally augmented in all the shots featuring them in close-up. 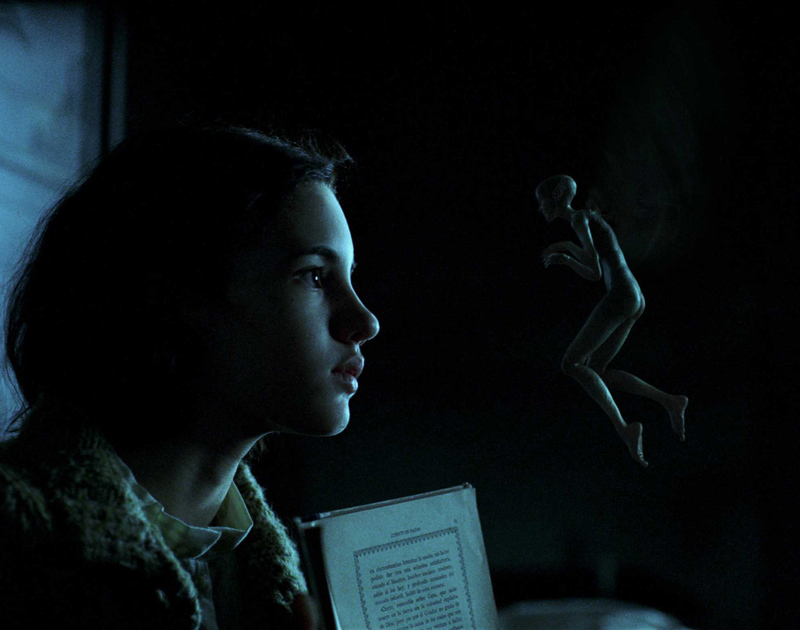 When the Pale Man grabs and violently devours the two fairies, Jones enacted the sequence by biting condoms filled with artificial blood, which were then replaced by digital fairies in post-production. The most complex digital augmentations in regards of the creature were however used in profile views of the creature walking. 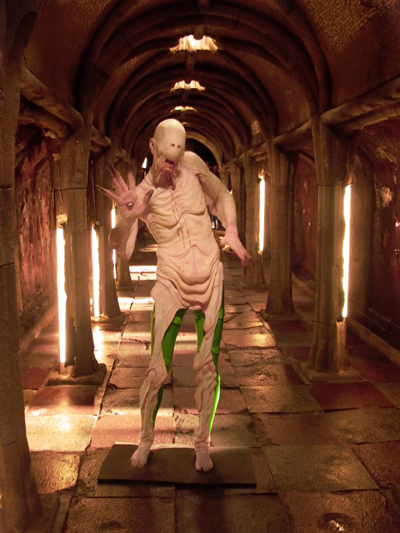 CafeFX created a digital double of the Pale Man’s waist and legs, animated them matching Jones’ performance, and rotoscoped them accurately. As in the Faun’s case, clean plates were used to recreate the missing portions of the background. 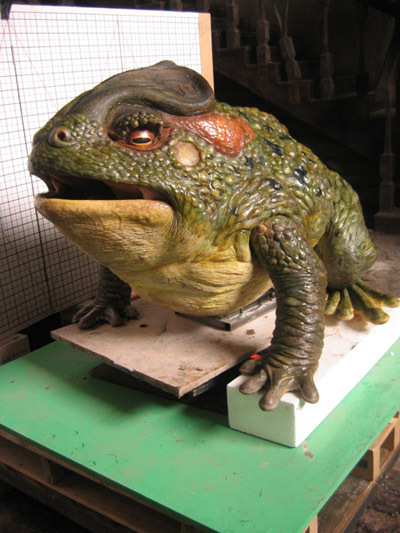 For more images of the Creatures from the film, visit the Monster Gallery. 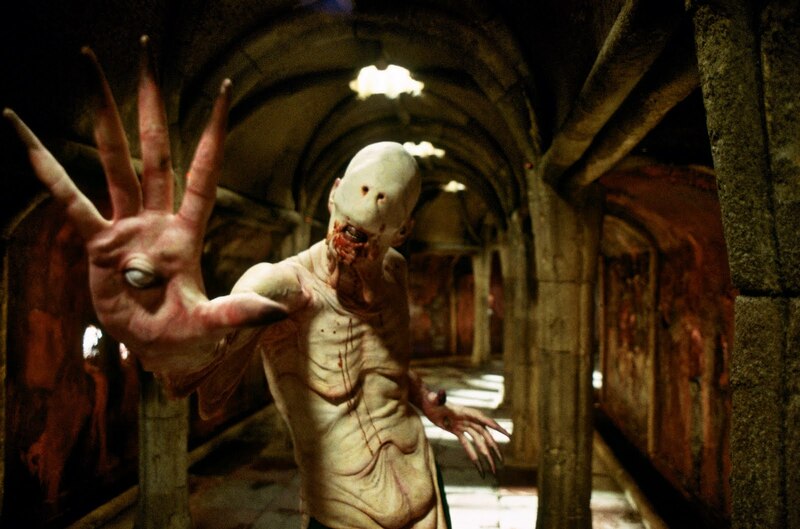 Posted on 22/12/2014, in Movie Monsters and tagged DDT FX, Guillermo del Toro, Pan's Labyrinth. Bookmark the permalink. 1 Comment.